I found this Amarylis, stuck in between other pieces of work, and I just had to add a little, something, something to it, to spice it up a bit. I realized that I did not have any winter painting to put up in my studio.....which I do to greet guests that visit. (Mostly, I like to greet myself with something new for each season). So this is it! I hope that you are enjoying the week. I fell asleep at early last night, so missed the Eclipse. My Daughter-in-law stayed up and saw the whole thing....can't wait to hear what she thinks. No doubt, she is sleeping at the moment..... but, well worth staying up to see. I was unable to get a good photo of the Moon this evening, but I tried. The skies have been overcast all day, so to have it shine tonight is a wonder. If I can stay up, I would love to see the eclipse tonight. I had fun with this photo....very blurry, but intriguing, don't you think? Yesterday, I went to Loveland with my Art Group to see a most wonderful exhibit. 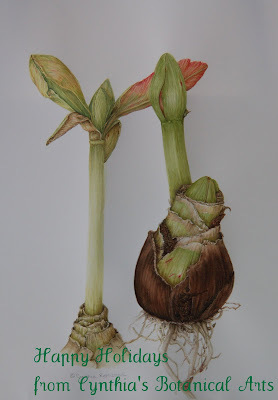 If you live in the area, and you love Botanical art (which would probably be why you are reading this blog), then you should try to get to this exhibit. Loveland Museum is at 503 North Lincoln Ave (or Hwy 287 and Lincoln Ave.) in Loveland, CO. They ask for a donation of five dollars, but it is only a suggested donation. However, to support the arts, I think that is more than fair. The exhibit is downstairs, in a wonderful room which happens to show the work beautifully. I know most of the artists. Each one is unique in their technique, style, and medium. There are watercolors, colored pencil, oils, and etchings, as well as combinations of the above. The work is done by several instructors at the Denver Botanic Gardens Botanical Illustration Program, and several graduates of the program. All are working artists. What a treat! We spent two hours in the museum because there is a lot to see through out the spaces, upstairs and downstairs. We are fortunate to have these wonderful exhibits in Northern Colorado. I have scanned the brochure of the exhibit for you, which I hope that you can enlarge, as there will be demonstrations through out the time of the exhibit, as well as classes available. This exhibit is really worth seeing!! Of course, I love the artists in this exhibit. I had not seen before which was a true delight. So, if you live in the area....GO! is going on. Well, worth checking out. I have been trying to get on the blog, once a week, during the holidays. That has been harder than I thought. One of the very important parts of the Holiday, for me, is visiting with friends. So, I have been 'playing' and eating out.... running to Loveland, and generally celebrating the most important aspect of the Season......the people. This has been such a hard year for so many friends and family. From politics to health, work and finances - it has been a rugged path for most of us. The highlights of Nature, Good health results (after scary diagnosis), good healing, and small moments of joy, seem to sustain most of us. Once in a while, you get a big thrill.....like the celebration of Marriage....which we enjoyed. That makes some of the other stuff much more tolerable. I hope that what ever faith you practice, it will bring you Peace and Blessings this Holiday season and in the coming year. For me, all faiths bring value to my life..... but at its core, Kindness and caring can carry every person to a better place. So, Hugs, and more Hugs to all of you, who have followed this blog through thick and thin. (been a lot of 'thin' these past weeks, so a double thanks for continuing to check in). I will try to write another blog this next week.... then the kids come for a visit, and I will be taking a break until after the New Year. I can't quite focus in on the holidays here. Hanukkah came a bit too early for me this year, and there isn't any snow.... in fact, the temperatures are way above normal (let's say, in the 50's and 60's here).... though, I think I have been eating a few too many of the Hershey's Candy Cane kisses (not for the faint of heart). I can always get into celebrating with sweets. This morning, I walked around the upstairs with my camera in hand. I thought that you might enjoy seeing what is on my book shelves, for starters. I have so many books. Piles and piles of them...so, I am showing you a little sliver of what is on the shelf. 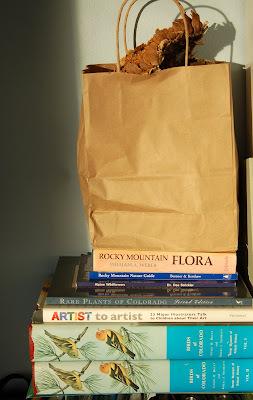 In between the books are my white notebooks, from classes at the Denver Botanic Gardens Illustration Program. They are filled to the brim with ideas and work done for every class. They are also scattered betwixt and between all my other books. tucked in there....for those 'wish lists' of art supplies. The bird books came from my Mother-in-law. of my Art group cheered her on from the car. We kept the motor running for a fast getaway. I am suppose to be drawing them. to work on the Fairy Slipper. This drawing is only about three inches tall. 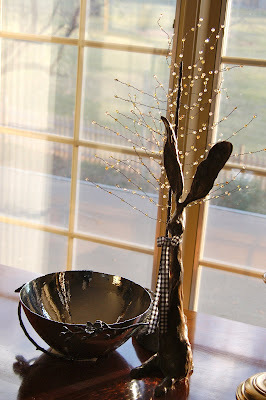 a few other pieces, to decorate for Christmas. filled with pine cones and greens. So, I better get back to business and finish decorating the house..... but I will be back to share more tidbits of my scattered 'Holiday' mind. Wishing you the best this week! Hello after a long absence. We took a break and went south to warm our bones and celebrate Thanksgiving with family. The weather was perfect. We had sunshine and warm breezes every day. I love the beach. It calms me. I love the Holidays..... but they get a bit frenetic at times.... and the beach just takes me to a good place. I haven't even looked in my studio. Haven't wanted to, as yet. I want to spruce the house up for the Holidays.... celebrate Hanukkah...and get ready for Christmas. We do both in this household. So, for those of you who celebrate Hanukkah; "HAPPY HANUKKAH". looking for sharks teeth and shells in the waves. which I will try out next time I visit. laughter of children and grownups. It feeds the soul with calm and contentment. You MUST do the thing you think you cannot do".